Wade's world: "There is a sense of quiet over the city"
"There is a sense of quiet over the city"
They were roustabouts and drillers, managers and technicians. The oldest, David Rae, was from Dumfries, a 63-year-old grandfather, who had already had told friends he wanted to retire. James Costello, of Aberdeen was one of the youngest, just 24, a computer planner with his life in front of him, “one of the industry’s brightest prospects,” according to his boss. As early as dawn yesterday it was clear that all 16 men had died in an instant, when Bond Super Puma AS 332L Mk II came down in the North Sea, 14 miles north east of Peterhead. These lost lives brought a jarring stop to the communities of north east Scotland, where self-image and success are intermingled with North Sea oil and gas. Eight of the dead came Aberdeen and towns close to it, places such as Oldmeldrum and Kintore; all had worked out of the city. 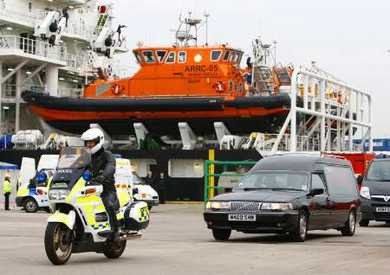 Assistant chief constable, Colin Menzies, had noticed an eerie stillness as he walked through streets from police headquarters to be at the harbourside as the first bodies were brought ashore at a little after eight o’clock. The first cortege had made its way through the dock gates before the sun had even risen over the harbour. A lone police motorcyclist led out the briefest of processions from Albert Quay. First a hearse. Next, a black van, wearing the livery of a local undertaker. And at the rear, a second hearse. By the bleakest of ironies these bodies had been brought ashore by the Caledonian Victory. Just six weeks earlier, the support vessel’s rescue craft had plucked 15 men, alive and well from the icy waters off Peterhead, after another Super Puma helicopter, flying in thick fog, had ditched into the North Sea. Another three men had also been saved. What then had seemed to many “our miracle of the Hudson” – a reminder of the Airbus A320 that ditched in New York in January with no loss of life – had brought a moment of unbelievable joy, shared by police, coastguards and rescue workers. This time, when the Caledonian Victory’s bow doors opened dockside at 4:30am it was these selfsame officials who faced bleak and unenviable tasks. Identifying and preparing the dead for the short ride to the city mortuary; interviewing rescuers who had found the corpses bobbing up and down on a calm sea; screening off the harbourside with tarpaulins to keep prying eyes out of the most sombre business. As the identities of the dead leaked out, so did the details of their lives. Stuart Wood, who worked for Expro, was a keen footballer and a “great personality”. At 62, Alex Dallas, had only just moved to Aberdeen for his job – his neighbours already admired him as “friendly and sociable.” Bill Munro of Bond Helicopters, paid tribute to the “dedicated” and popular young pilots who had died, Captain Paul Burnham, 31, and co-pilot Richard Menzies, just 24. At the 12th century Kirk of St Nicholas Uniting, a book of condolence was opened in a chapel dedicated in 1990 to the oil and gas industries. A steady steam of signatories came to pay their respects. Reverend Andrew Jolly, the chaplain to the oil and gas industry, had watched this dignified procession of visitors. Like A former army chaplain, even that experience could not prepare him for Tuesday’s events. Easter, he hoped might bring faith in resurrection and eternal life, but he acknowledged the crash was a test of faith.